For the first time in nearly 45 years, the recurrent nova T Pyxidis is in outburst. The usually quiescent 15th magnitude star has rapidly brightened to around magnitude 7.5 to 8.0. If it behaves similar to previous outbursts a further brightening to around magnitude 6.4 should occur over the next month. Novae are the result of a thermonuclear explosion caused by the buildup of hydrogen on the surface of a white dwarf. As members of a double star system, the hydrogen is stripped from a normal main-sequence star unto the white dwarf. After each explosion it takes some time for the hydrogen to build up again in order to create the next nova outburst. The recycle time can be on the order of thousands to millions of years. A rare class of recurrent nova experience outbursts much more frequently (on the order of tens of years). The shorter outburst interval is due to the white dwarf being near the Chadrasekhar mass (the mass at gravity wins out and a white dwarf would collapse in a Type Ia supernova) and a high rate of hydrogen transfer between the stars. On April 14, amateur astronomer Mike Linnolt of Hawaii spied T Pyxidis at magnitude 13. Though faint, this was a full 2 magnitudes brighter than usual and a clear sign that a new outburst had begun. Over the next 2 days, the nova rapidly brightened and many observers (including myself and friend of the blog Salvador Aguirre) are currently placing it at magnitude 7.8 (give or take a few 0.1 mags). 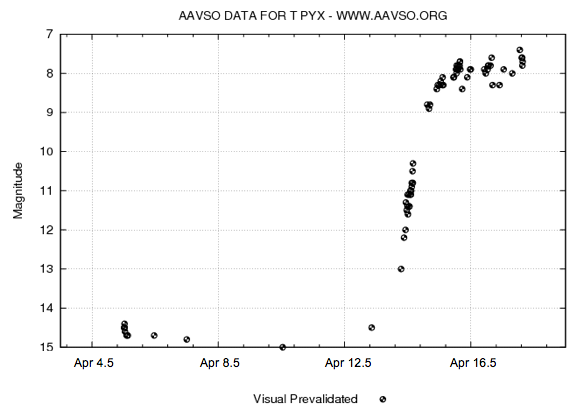 Visual lightcurve for recurrent nova T Pyx. Credit: AAVSO. According to Dr. Bradley Schaefer (Louisiana State University) the nova should slowly brighten further over the next month and become as bright as magnitude 6.4 by May 20. This is based on previous outbursts of T Pyx. More can be found from Dr. Schaefer at the AAVSO website. The current outburst is the 6th observed outburst by T Pyx. The previous 5 having occurred in 1890, 1902, 1920, 1944 and 1967. An earlier outburst from around 1866 is surmised by debris observed by the Hubble Space Telescope. There have been predictions that the rate of material collecting on T Pyx is slowing down and future outbursts will occur at longer intervals and might even stop for an extended period of time. T Pyx is located in the faint southern constellation of Pyxis (the mariner’s compass) at a declination of -32°. This makes the star a difficult object for northern observers. Even when if it reaches 6th magnitude it will be a binocular or small telescope object for most observers.